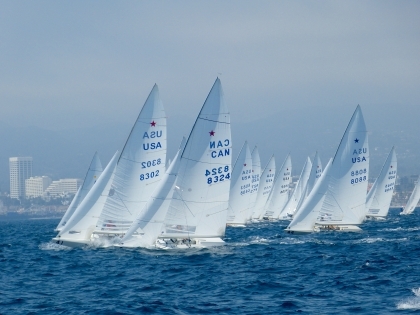 Today was day 1 of the Star North American Championship in Marina del Rey, California. The conditions were beautiful for Star sailing; 7-9 knots with a moderate sea. In race 1, Eric Doyle, with Payson Infelise up front, held a narrow lead of Arthur Lopes and I. Eric had a bad start but dug his way out by playing the left side of the course and it worked. Rick Merriman, Vasella/Trinter and john MacCausland with Arnis Baltins rounded out the top 5 and things pretty much stayed that way around the 6 mile race track. In Race 2, I was a bit late at the start and was just barely able to get a clean lane. We were forced to the right pretty quickly and rounded the first mark 8th. Benny Mitchell with Patrick Powell crewing held a comfortable lead at the first mark after a 1.7 miles windward leg. Eric Doyle was second, with Vasella, Andy Mac Donald, and Merriman in a tight group. Mark Reynolds, out sailing for the first time in a while rounded just ahead of Arthur and I.
Arthur and I had a good downwind leg to round the gate 4th and all but caught Doyle and Mitchell by the second windward Mark. 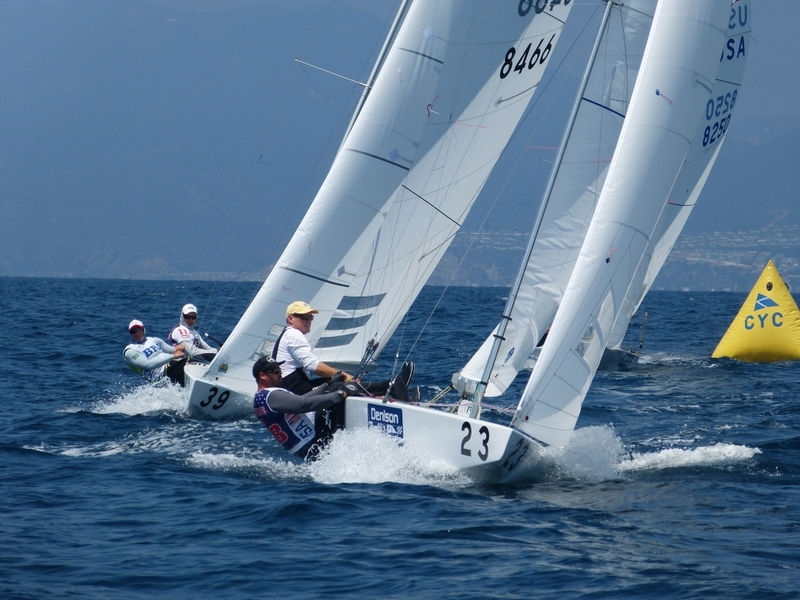 We could not quite get around them and the three of us finished within 3 boat lengths with Mitchell taking the win, Doyle 2nd and Arthur and I third. So after Day 1, Doyle leads with 3 points, we are second with 5, Vasella is third with 9 and MacDonnald and MacCausland are tied on 11. 6 more races are scheduled for the championship which will end on Sunday. I am also posting on my FaceBook page. Trying to move into the 21st century.